Skyline Queen on the Chicago River with our Riverside Gardens box office in the background. From daytime views of the city's skyline, to date nights under the stars with wine, to picture-perfect mornings with dogs on boats on Lake Michigan, Mercury, Chicago’s Skyline Cruiseline launches its 83rd season on Friday, April 27 with a schedule full of fun, special-themed daytime and evening cruises and tours for all ages. 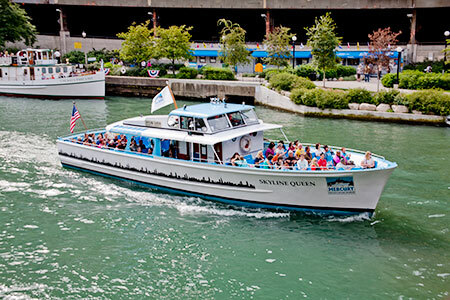 Mercury, Chicago’s Skyline Cruiseline offers locals and visitors a front row seat to the city’s breathtaking skyline, historic landmarks and modern marvels through a variety of fun, narrated family-friendly cruises and special tours. View fact sheet to learn more.